The Plot: Prodigy, Peter Parker’s newest alter ego, foils an attempt by Conundrum’s men to kidnap Ambassador Chaliz. Unbeknownst to Prodigy, the event was staged to draw attention away from the kidnapping of Chaliz’s daughter, Tabriaz. Conundrum announces his ransom demand for Tabriaz, the priceless Hand of Mumthazi. Ambassador Chaliz is unable to deliver the Hand because it’s recently been stolen from a museum by Mad Jack. Prodigy promises Chaliz that he’ll rescue his daughter. Meanwhile, Conundrum confronts Mad Jack in an abandoned bar. Prodigy arrives and interrupts their fight. To his shock, they team up against him and shrink him to a doll’s size. The Subplots: Flash, who’s now officially dating Betty, reflects on how well his life is going. Anna Watson gives Peter the details of her affair during her first marriage. She was married to struggling radio drama writer Jacob Hilliard when she fell for singer Johnny Diplama. Consumed by guilt, she left California and was taken in by Aunt May and Uncle Ben. Billy Walters is portrayed as a photographer during the opening of the issue. A line of dialogue later clarifies he wants to be a reporter, however. The mysterious Conundrum makes his debut. There’s a ridiculous amount of cryptic hints regarding both Conundrum and Mad Jack this issue. Conundrum supposedly has no knowledge of his past life, but does seek guidance through meditation from his deceased “master.” Later, Mad Jack claims that he taught Conundrum most of his tricks. Mad Jack, we discover, has a bond with the abandoned bar Maquire’s (also the name of his cat), dwells on the “torments of his past,” has a connection to Conundrum through an “old man,” and has a “romantic streak” according to Conundrum. I Love the ‘90s: Flash’s three guesses for Betty when she plays the “Guess Who?” game with him: Courtney Love, Kate Winslet, and Fiona Apple. Production Note: Numerous lettering mistakes this issue. The title is on the wrong side of the opening splash page, omniscient third person captions show up in quotation marks, lines of dialogue repeat in one panel, and the final splash page bungles Mad Jack’s gigantic word balloons. Review: The credits page acknowledges that this is J. M. DeMatteis’ final issue, but I wonder if he even knew this when writing the story. I’d like to think that he wouldn’t introduce yet another mystery character, drop more fruitless hints regarding Mad Jack’s identity, and leave on a cliffhanger in his final issue. It’s a shame that the J. M. DeMatteis and Luke Ross era of Spectacular had to end like this, with so much unrealized potential. There were a few rough spots during this stint, but the signs of a potentially classic run were there. A more polished Ross and a more focused DeMatteis, working on material that could gel within the confines of a franchise comic, would’ve produced some great Spidey stories. Stories that, perhaps, could’ve brought some fans back to Spider-Man without all of the hype surrounding a reboot. Instead, Spectacular was left to practically languish with no support from the rest of the franchise. The events of this title should’ve been felt across the line, but the “hands off” policy of the era instead left one book attempting to tell bold Spider-Man stories and three other titles that often read like fill-ins. And with Spectacular cancelled, the readers are stuck with numerous plot threads left dangling and mysteries that will only end in even more frustrating resolutions. 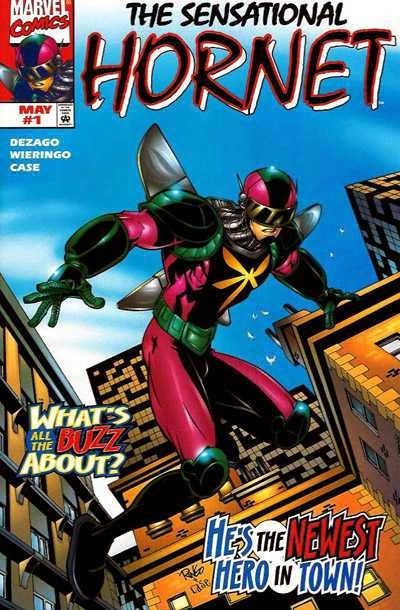 As the introduction of the fourth false identity, “Prodigy” is a fairly average chapter in the “Identity Crisis” event. To be honest, I suspect J. M. DeMatteis wasn’t overly thrilled by the crossover but is playing along and trying to make the best out of the concept. The hook for Prodigy is that he’s based on the classic superheroes from the comics Peter found in Uncle Ben’s attic. That means he acts and speaks like a Silver Age DC superhero, “square-jawed, decent, uncomplicated -- and everyone seems to loves him!” He’s the hero Peter wishes he could be, were he not plagued by self-doubt and rotten luck. It’s a solid starting place for an idea, but intentionally making the character generic is a risky move. Of the four identities, Prodigy arguably has the least interesting visual and powers (he can fly, somehow, and that seems to be it). 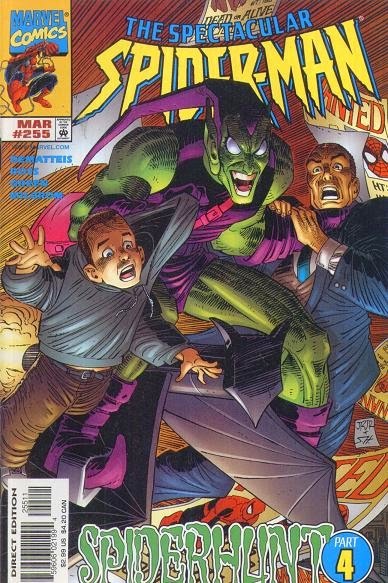 I also question why the concept of Norman Osborn adopting Prodigy as his personal hero, and weapon against Spider-Man, is showing up again when it’s already being used for the Hornet in Sensational. How did no one catch this? There’s also the dubious arrival of Prodigy at the story’s end, when he’s magically able to locate the villains in time for the issue’s climax. This month’s Peter Parker, Spider-Man already used that specific plot convenience. These event stories require tight editing, which is not a hallmark of this era of Spidey. Finally, there’s the introduction of Conundrum, the mystery villain that Spectacular absolutely did not need at this time. I give credit to Luke Ross for the visual, a bizarre Arabic puzzle mask that folds like a Rubik’s cube, but there’s more than enough cryptic, unexplained behavior in this book right now. Unless Conundrum is being introduced as a means to unravel the Mad Jack mystery, he’s best left on the shelf for a while. The Plot: The Trapster now has a price on his head, so that no loose ends remain from the framing of Spider-Man. He defeats a group of Hand ninjas, but is soon targeted by Shocker. Meanwhile, during a secret meeting at a cemetery, Detective Snipes and Arthur Stacy convince Spider-Man to approach the Trapster in a different identity and convince him to confess. As Dusk, Spider-Man rescues the Trapster from Shocker. He explains that he’s also been targeted by Norman Osborn and the two agree to team up. The Subplots: Jill has returned to school. MJ is increasingly aggravated by the stress caused by Peter’s life as Spider-Man. Forever Young: MJ, twice in the same panel, spontaneously declares she’s too young for this stress. She then repeats the “too young” claim a few pages later. This is the beginning of an irritating theme that continues into the reboot -- Peter and MJ keep claiming they’re “too young” for anything that happens to them. The creators also hammer home the idea that they were too young to get married. Never mind that just a few weeks before this issue was published, Peter’s college days were established as being nine years ago in one story produced by the same office. I Love the ‘90s: MJ’s just going to wait around for Peter until she grows old…NOT! Review: PPSM is often the weakest of the four monthly titles, but I was hoping that “Identity Crisis” could bring something out of the book. Given that this title served as impetus for the event, and is the one dealing with the Trapster, it’s not outrageous to expect a bit more from its contributions to the storyline. Instead, we get this half-hearted effort. Yes, the art is as solid as ever, but I could nitpick this story for days. Cliché elements that I can’t stand, like the Hand being dismissed as pathetic, disposable foes. MJ acting even more unlikable than usual in a Mackie story. (Even though this seems to be an intentional choice in order for Peter and MJ to have a heart-to-heart, at the end she’s still as irritable and petulant as she was before the conversation.) Lazy plotting, such as Dusk being able to magically find the Trapster. Jill just popping up fine and dandy after being near death an issue or so ago. Lazy scripting, such as the art and script disagreeing on the spelling of “Cypress Hills” in one scene. Lifeless dialogue, with no real personality for any character. And Dusk, so far, is the least interesting of the new identities, even if John Romita, Jr. succeeds in making a black void look cool. We’ve seen some attempt to tie Spider-Man’s unique traits into his other identities, but Dusk really is just a void. With no personality and not much of a gimmick, he’s just kind of there. It could be argued that Spider-Man’s powers enable him to be stealthier than the average hero, which I suppose is Dusk’s hook, but the issue doesn’t communicate the idea at all. Instead, it’s Spider-Man in black pajamas, switching identities because that’s what the story demands. ‘Round and ‘Round with Ricochet! The Plot: Peter debuts his Ricochet persona, spontaneously deciding that he’ll pretend to be a criminal seeking a cut of the crimes he’s stopping. He’s stalked by Delilah, who asks him to join her in her war against Black Tarantula. Ricochet reluctantly agrees. Meanwhile, Robbie and Martha Robertson take a vacation to the island of Euboea. Unbeknownst to Martha, Robbie and a mystery figure are investigating Norman Osborn. Nearby, Alison Mongrain meets the Secret Order of Scriers on Osborn’s yacht. After taking a mystery object from her, they destroy the yacht. A shadowy figure observes the bombing. Robbie watches as an injured Alison is later rescued in the water. The Subplots: Black Tarantula and the Rose meet with Fortunato to make peace. Meanwhile, Chesbro continues to spy on Professor Caches. MJ and Shantal are shocked to discover Caches has a son. When Chesbro reports back to Black Tarantula, he declares that vengeance is his real reason for entering New York City. Web of Continuity: Delilah repeats the claim that Black Tarantula is immortal. I Love the ‘90s: The issue opens with Ricochet stopping a group of criminals from robbing a shipment of “Bear Babies,” which is a takeoff on the Beanie Babies. Later, Ricochet tells Delilah that approaching strange women is usually too “Bill Clintonish” for him. Review: The Green Ninjas are gone, but Tom DeFalco still can’t let go of this Black Tarantula nonsense. The very first chapter of this storyline (well over a year ago at this point) showed promise, but since then it’s all gone downhill. I admire DeFalco’s determination to finish what he’s started (unlike some of the spinoffs of this era, Amazing isn’t going to be wrapping up with a dozen dangling plotlines), but every time I see Rose, Delilah, and/or Black Tarantula, my eyelids start to get very, very heavy. Is any reader particularly invested in whether it’s Rose or Black Tarantula who runs New York’s mobs? Does anyone care about Black Tarantula’s custody battle with his ex-wife, Professor Caches? Why are we still getting these tedious stories? When the issue isn’t dwelling on the gang war monotony, DeFalco finally advances the ongoing storyline that people do care about. Whether or not Alison Mongrain has the Parkers’ baby is the kind of question that shouldn’t have been pushed into the background, especially when the main plots have been such utter bores. I suspect we’re only checking in on Alison again because the word’s come down that a reboot is coming, but at least it’s an excuse to get away from this Black Tarantula tedium. The plot consists of the Scriers taking a mystery “something,” blowing up the yacht for no clear reason, and Alison surviving in one of those only-in-comics type escapes. Also, two different mystery figures shrouded in darkness appear. So, it’s a bit of a mess. (And Joe Bennett seems to think “a shadowy figure” means someone literally made of darkness.) I do like Robbie Robertson’s role in this, however. It’s nice to see Robbie, and presumably Jonah, doing something to proactively undermine Norman Osborn. Their contributions to the stories have consisted of being threatened or nagged at for far too many months now. Oh, yeah. Ricochet also debuts this issue. Ricochet’s gimmick plays off Spider-Man’s agility, which is fair enough. He also uses tiny discs in battle, which is logical given the other devices Peter has devised during his crime fighting career. 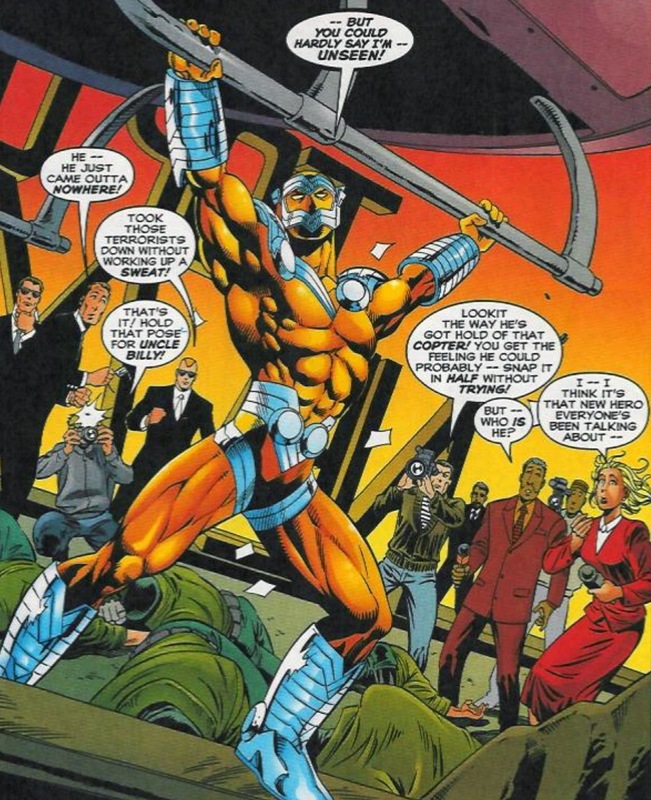 There still isn’t that much to the character, which is probably why DeFalco has added the idea that Ricochet is pretending to be a criminal in order to get closer to the underworld. Overall, it’s not a bad concept. It’s just too bad he has to debut in yet another chapter of this insufferable gang war storyline. The Plot: Spider-Man uses an anti-gravity harness developed by Hobie Brown as the basis for his new costumed identity -- The Hornet. He soon discovers the Looter robbing the Daily Bugle’s safe. Flash Thompson also stumbles upon the Looter and is taken hostage. Hornet uses his quick wits to rescue Flash and apprehend the Looter. Norman Osborn, impressed by his actions, offers the Hornet a place on his team. The Hornet flies away. Watching the press coverage outside the Bugle, the Vulture is incensed when the Hornet claims that no one will have to worry about Spider-Man now. The Subplots: Peter tests out the anti-gravity harness by giving MJ a ride through the sky. When it’s clogged by bird feathers, they nearly crash. Later, Billy Walters is stood up again by Peter when he goes into action as the Hornet against the Looter. Web of Continuity: The "stingers" Peter uses as the Hornet are the ones Ben Reilly designed as the Scarlet Spider. I Love the ‘90s: Billy calls the large shadow he sees in the sky (presumably the Vulture) “X-Files freaky.” Later, Billy watches a news promo that says they’ll have the latest on the Hornet, “tonight following E. R.” There are also references to Seinfeld reruns and Conan airing in late night, but that’s still true as I write this today. Gimmicks: All of the initial “Identity Crisis” covers are actually double-covers. One with Spider-Man and one with the new identity. The cover price remains the same. You can view an archive of every cover on the I Love Comic Covers blog. Review: After a month of teasing, “Identity Crisis” finally begins. I remember the initial response to the solicitation hype was tepid to say the least, but the titles gained positive word of mouth as the months progressed. The only positive word of mouth I can recall the Spider-Man books receiving during this time, to be honest. I have no real affection for any of the alternate identities, but I can’t say any of them particularly bother me either. I recognize this as a gimmicky event storyline from the get-go, and I don’t think there’s any attempt by the creators to hide this fact, which is admirable. It’s a fun diversion for a few months, and that’s a decent enough justification. Within the context of the story, there’s no real reason for Peter to suddenly adopt four new identities (one would clearly do if his goal is simply to avoid being Spider-Man), but I can see the appeal of giving him a different persona in each spinoff. It’s a creative use of the multi-title format, and it’s a clever way to have the titles connect with one another without directly crossing over. Todd Dezago and Mike Wieringo open the event with yet another reminder of how much they love the Looter. I liked their previous use of the villain, although I think they take his obsession with his precious meteor too far this issue, indicating that he genuinely loves the rock and is now treating it like a high school crush. It’s too silly to come across as creepy, yet not funny enough to justify the diversion into surrealism. The light-hearted tone works better in other areas, thankfully, such as the playful narrator. Narrators in superhero comics are usually boring or pretentious, on the rare occasion they appear anymore, so it’s a relief to see someone try to make the narrative captions special. My favorite bit is when the narrator switches to the wrong flashback by mistake. Sensational, at its best, is a book with personality, and that’s on display this issue. 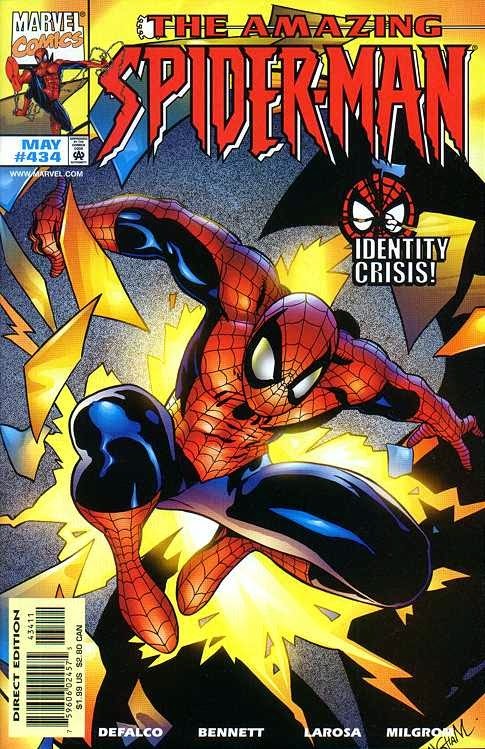 Regarding the Hornet identity, the creators do put some effort into making the new persona remain unique to Peter Parker. Hobie could never use the anti-grav harness as the Prowler, but Spider-Man’s super-strength can carry the excessive weight without a problem. 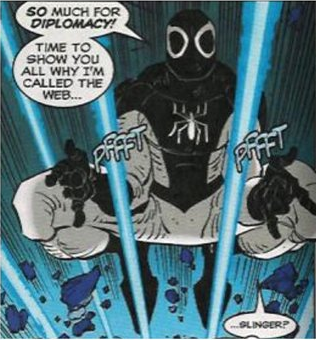 Ben Reilly already adopted the use of stingers, so it’s logical that Peter would revive them. And I suppose it could be argued that spider-powers and hornet-powers would both allow Peter to move like an insect, so there’s no big stretch there. I do think it’s strange that Peter is making very obvious statements as the Hornet that indicate a connection between him and Spider-Man, which would seem to undermine the entire point of the story. This could perhaps be dismissed if done as a quick joke, but instead it becomes a major plot point, leading into the next issue’s Vulture story. The Plot: The White Rabbit hijacks the airwaves and announces her ransom demand for Grizzly and the Gibbon. The mayor laughs in disbelief. Peter and MJ see her announcement, leading Peter to adopt the impromptu disguise of the Bombastic Bag-Man. He crashes the White Rabbit’s hideout, but allows Grizzly and the Gibbon to have the final victory over her. When he returns home, MJ unveils the new costumed identity she’s created for him, Prodigy. The Subplots: Norman Osborn obliquely threatens Jonah’s wife again when he refuses to be interviewed for Osborn’s biography. Flash, meanwhile, grows closer to Osborn. Aunt Anna reveals to MJ that she was married at eighteen and that her infidelity killed the relationship. Peter does have the Dusk suit at this point, but he isn’t near home when he sees White Rabbit’s ransom demand. MJ is stunned to discover Aunt Anna was married. I Love the ‘90s: One of White Rabbit’s flunkies tells her she’s a better actress than Pamela Lee, which was briefly Pamela Anderson’s professional name while married to Tommy Lee. Later, there’s a reference to Al Gore and boring speeches, Grizzly claims that not hitting White Rabbit would be considered sexist in the ‘90s, Peter wonders if he’ll get a cartoon on FOX, and MJ speculates that Leonardo DiCaprio and Jim Cameron will make a Prodigy movie one day. Review: It’s another Spectacular issue that’s clearly intended as a comedy, even though the subplots are just as serious as ever. I maintain that this is an odd choice to make, creating issues with such bizarre tonal shifts they read as schizophrenic. Maybe other readers are able to make the leap from caring about Flash’s recovery from alcoholism to laughing at the White Rabbit’s sardonic actors-for-hire henchmen back to sympathizing with Anna Watson’s painful past, but the tonal shifts just get on my nerves. I don’t mind inserting comedy into the stories, but entire plots that are plainly intended as farcical comedies should probably be done as standalone issues. 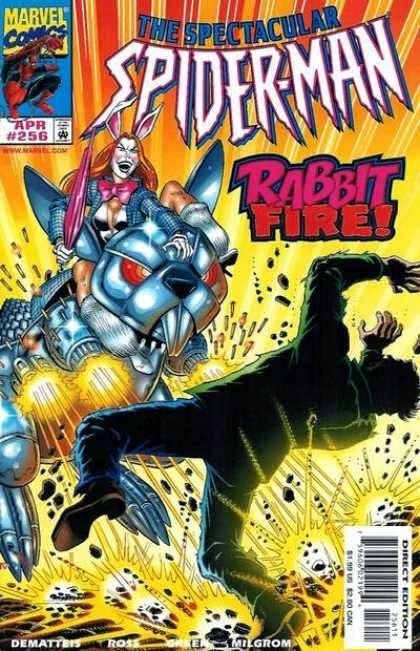 And while I do find most of the White Rabbit material pretty amusing, I think the Bag-Man joke falls a little flat. I understand that it’s a reference to a DeFalco/Frenz issue of Amazing, but in my opinion that hurts the joke because we’ve already seen it before. Couldn’t Spider-Man devise a different wacky get-up? There is one aspect of the issue that sets it far above the rest of the titles of this era -- MJ is actually acting like MJ. She’s supportive of her husband while also being upfront about her own misgivings regarding his life as Spider-Man. And she’s funny, compassionate, and slightly quirky. She’s, heaven forbid, a well-drawn female character with a distinct personality who doesn’t exist merely to insert hackneyed drama into the hero’s life. What a concept. It Started on Yancy Street…Again! The Plot: Peter and MJ are looking for a restaurant on Yancy Street when an interdimensional vacuum suddenly opens. As Spider-Man, Peter chases after three teenagers who have been sucked into the void. SHOC arrives and uses his powers to provide Spider-Man an anchor into this world. 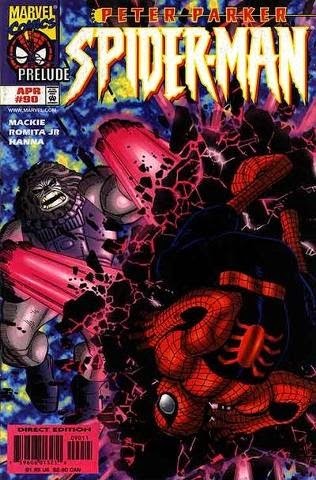 Spider-Man soon finds himself inside the Negative Zone, where a group of rebels is fighting against Blastaar. 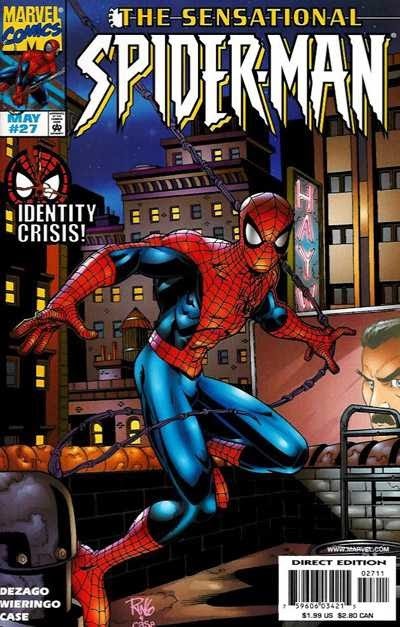 Spider-Man joins the rebel leader Dusk, who offers to help him find the missing teens. When Dusk is injured in battle, Spider-Man assumes his identity. Eventually Spider-Man inspires the rebels, defeats Blastaar, and rescues the teens. He returns home wearing the new Dusk costume. SHOC feels his powers might be connected to this portal to the Negative Zone. 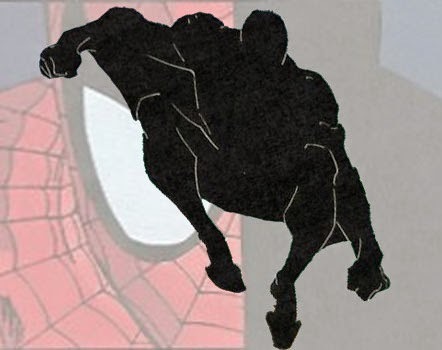 Traveling into the Negative Zone has altered the colors of Spider-Man’s costume into black and white. Spider-Man lands on Tarsuu, which is a planet inside the Negative Zone. The rebels theorize that the portal to Earth was created by Blastaar’s attempts to find new dimensions to conquer. We discover that this Dusk isn’t the original Dusk, his parents (or perhaps the parents of an earlier Dusk) were killed by Blastaar, and that the original Dusk was thrown into the distortion field between Earth and the Negative Zone. How Did This Get Published? : Spider-Man to the imperial troops on page ten: “I traveled a long way to rescue guys dressed just like these three kids just dragged off. I’m not leaving without them.” No one read this line and thought it could stand a rewrite? Review: One more issue building up to “Identity Crisis,” although thankfully it’s not another one ending with Peter and MJ deciding that he should adopt a new identity. It is, however, another issue with a whiny, nagging, and anxious MJ. The issue opens, literally on the first panel, with MJ scolding Peter for taking a coworker’s advice and looking for a restaurant on Yancy Street. It’s impossible now to even get through one page of these stories without seeing this horrible, off-putting mischaracterization of MJ. It’s amazing to me that anyone thought remaking MJ into such an unbearable shrew would somehow draw readers back into the Spider-Man titles. The purpose of the issue is, obviously, to introduce the Dusk costume. 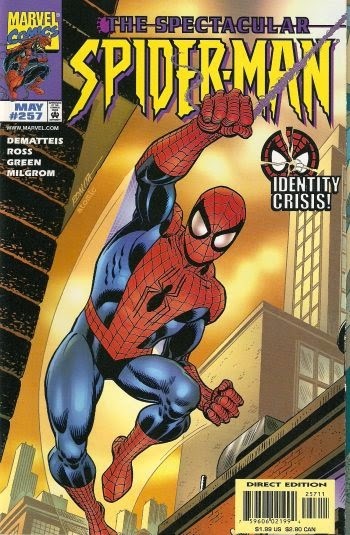 I think the other outfits don’t have origins more complicated than “Spider-Man made it” or “Spider-Man made it with MJ and/or the Prowler’s help.” Attaching an actual story to one of the outfits isn’t a bad idea, and it gives John Romita, Jr. an excuse to draw a sci-fi setting he wouldn’t normally be allowed to explore in this book. 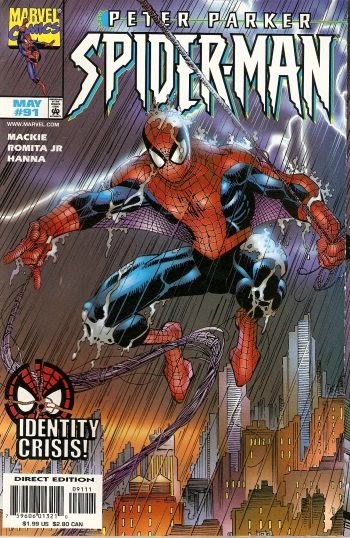 We’re also graced with another variation on Spider-Man’s costume, which serves no story purpose whatsoever, but I guess was one more option for Toy Biz to merchandise back in the ‘90s. The Negative Zone look did appear in one of the early Spider-Man Playstation games, so it does have its own small place in history. Does anything particularly entertaining come out of this Star Wars riff? Not really. The art is dynamic, and the change of pace does break up some of the monotony of the previous issues, but at no point in the story do you ever care about Dusk and the rebels. Mackie seems to be connecting this plot to his ongoing SHOC storyline, establishing a few similarities between SHOC and Dusk. SHOC isn’t the original SHOC, Dusk isn’t the original Dusk. The true SHOC was taciturn and serious, the true Dusk was taciturn and serious. Both are missing, and SHOC’s powers have an unrevealed connection to the Negative Zone. Surely this can’t all be a coincidence. But surely we can’t expect a real answer, either. Assuming this all paid off one day, some of this issue’s flaws would be easily forgivable, but I don’t have the goodwill to assume these hints will ever go anywhere. The Plot: Robbie Robertson’s retirement party is held at the Roosevelt Hotel, which is where Mr. Hyde is staying in his civilian identity of Calvin Zabo. Peter overhears Zabo’s name at the check-in counter and, after talking to Ben Urich, realizes he’s Mr. Hyde. With no costume or webshooters, Peter secretly dons Phil Urich’s oversized sweatshirt and covers his face with the hood. Peter fights Hyde to a standstill until the NYPD arrives and gases Hyde into unconsciousness. The Subplots: Peter, Shantal, and MJ visit Jill Stacy in the hospital. Jill’s criminology professor Marina Caches also visits, with her boyfriend Dante Rigoletto. Peter is unnerved by Rigoletto for reasons he doesn’t understand. MJ suggests Peter find a new identity so long as Spider-Man has a price on his head. This is the third setup for “Identity Crisis” -- MJ hinted at the same idea at the end of Spectacular #255, and Spider-Man has already visited Hobie Brown in Sensational #26, after another incident where his costume got him into trouble. Peter is complaining about a sprained right ankle that only seems to exist in this title. *See _________ For Details: Mr. Hyde lost his change of clothes after fighting the Hulk on an airplane in Incredible Hulk #458. I Love the ‘90s: MJ and her friends joke about finding doctors that look like Eric LaSalle and George Clooney. Review: More time is killed while the titles await “Identity Crisis.” While I appreciate the novelty of seeing Spider-Man go up against a foe he hasn’t faced four hundred thousand times, and the more cohesive approach to the Marvel Universe we’ve been getting lately, it’s hard to pretend this isn’t filler. At least it’s non-offensive filler, though. 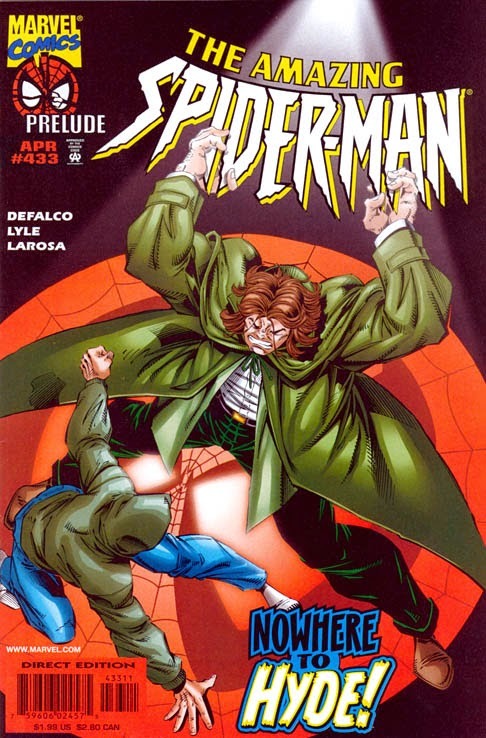 The story’s structured fairly well, and there’s a decent joke towards the end when Mr. Hyde has finally deduced that his mystery opponent is…his ex-partner Cobra, with his “blinding speed and agility.” MJ is also much more tolerable this issue, as she reiterates that she accepts Peter’s life as Spider-Man, she just doesn’t think he needs to specifically be “Spider-Man” in order to help others. Fair enough. And Peter exhibits some emotion for the very first time regarding Jill’s shooting, predictably blaming himself for allowing it to happen. There’s a classic Spidey feel to the issue, which is a feeling Amazing doesn’t have often enough these days. I do have issues with the art, however. I’m assuming Joe Bennett is considered the regular penciler on this title now, but even the perennial go-to fill-in guy occasionally needs a fill-in. Tom Lyle isn’t a bad choice to step in given his past with the character, although I’m not sure how he felt drawing a Spider-Man issue that doesn’t feature Peter as Spider-Man. While Lyle does a credible job on the action sequences, his civilian characters look unusually flat and generic for much of the issue. The most flagrant example of this would be Billy Walters and Phil Urich, who are pretty much impossible to tell apart when both appear at the party. This is the type of story that calls for very specific, human faces and unfortunately that’s not what Lyle delivers. The Plot: Hoping to collect the $5 million bounty, Hydro-Man holds a group of civilians hostage inside a water tower. Sandman sees the news reports and confronts Hydro-Man before Spider-Man can arrive. Spider-Man tries to rescue the hostages while Sandman keeps Hydro-Man preoccupied, but he’s hindered by the NYPD and another group of bounty hunters. Sandman stops Hydro-Man by merging their bodies together and allowing Silver Sable to freeze them. Spider-Man changes into Peter Parker and leaves with the last hostage, who passed out earlier. He leaves behind a web-dummy clothed in his costume, which is promptly shot by the bounty hunters. Later, Spider-Man asks Hobie Brown for help. The Subplots: Anna Watson teaches Hope sign language. Neither are Spider-Man fans. MJ tells Peter she’s sick of the drama surrounding Spider-Man. At the Daily Bugle, Peter realizes the blonde that’s been looking for him is Ben Reilly’s friend Desiree. He’s not able to have a real conversation with her because he has to rescue Hydro-Man’s hostages. Meanwhile, the Vulture is released from prison. *See _________ For Details: Sandman and Hydro-Man previously fought, and merged together, in Amazing Spider-Man #218. I Love the ‘90s: Billy Walters to Peter, who’s distracted when he spots Desiree across the room: “Uh…Pete? Yo, Dude…What’s the frequency, Kenneth?” There’s also a reference later on to being “deked,” as in “tricked,” but I have no idea if this is forgotten slang or something Todd Dezago invented. Review: This begins the month in-between “SpiderHunt” and “Identity Crisis,” the next event that has Spider-Man adopting four new identities in order to avoid Norman Osborn’s bounty. Why we’re getting this month break is a mystery to me; it’s not as if the reader needs four separate stories to set up Spider-Man’s decision to briefly change his superhero persona. Not surprisingly, when left with a month in-between events, most of the titles promptly go into filler mode. There’s nothing egregiously bad about this month’s Sensational, aside from Todd Nauck’s disproportionate balloon heads, but there’s nothing to get too excited about, either. Dezago touches base on a few of his subplots, but the only real advancement is a hint that Desiree’s psychic powers allowed her to feel Ben Reilly as he died, which somehow explains why she’s seeking out his only known relative. I would much rather the Ben Reilly supporting cast return to obscurity, but there is a hint of a good idea in here -- how exactly does civilian Peter Parker deal with mutants, especially one that can read his mind? The action plot assumes that the audience really wanted to see Hydro-Man again so soon, which is hard to believe, especially when his scheme this issue is so uninspired. 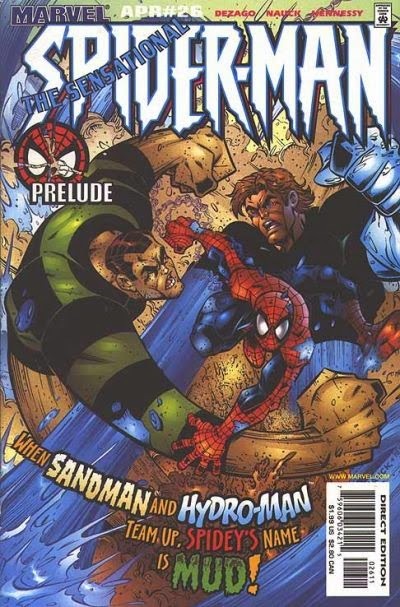 The plot’s structured so that the entire fight stays between Sandman and Hydro-Man, while Spider-Man is left rescuing the hostages. I like Dezago’s consistent focus on Spider-Man’s commitment to helping people, as opposed to constant fistfights, but it would be nice to see the title character have more to do. Also, Sandman’s plan is utterly ridiculous. I thought merging his body with Hydro-Man’s was supposed to be one of the most horrific experiences of his life, so why is he so eager to do it again? His plan also involves being frozen in that state with Silver Sable’s special gun…why? Sable makes a joke that he’s doing this for the overtime, but honestly, what kind of a plan was this supposed to be? I understand that some people view the Sandman/Hydro-Man fight in Amazing Spider-Man #218 as a classic, but I don’t think this is the sequel they wanted. The Plot: Spider-Man rescues the Punisher and a group of mercenaries from the collapsing building. He’s targeted again by Shotgun, but manages to escape. Later, the Green Goblin invades the Daily Bugle offices and roughs up Norman Osborn. He demands Osborn deliver $10 million to him on the Brooklyn Bridge or else he’ll never see Normie again. Later, Spider-Man observes the exchange from a distance and steps in when the Goblin double-crosses Osborn. Spider-Man chases the Goblin and captive Osborn to a nearby warehouse. When Spider-Man leaves to pursue the Goblin, Override discovers the $10 million. Meanwhile, Punisher and Shotgun, who have now teamed up, rescue Jimmy-6 from a group of Osborn’s mercenaries. Clarence Fielding follows Spider-Man and the Goblin to the Goblin’s hideout, and during their fight, rescues Normie. The Goblin disappears in a fiery explosion after crashing into a pile of scrap. Later, Osborn holds a press conference, thanking Clarence and Override for their help. The Subplots: Paul Stacy is angry with his father for considering Norman Osborn’s offer. Behind closed doors, Jonah accuses Norman of staging the kidnapping. Ben Urich notices that Jacob Conover is unusually interested in the new Green Goblin’s secret identity. Flash Thompson and Betty Brant are convinced, after seeing Norman’s response to the Goblin, that he sincerely has nothing to do with the Green Goblin. Later, Professor Angst treats the Goblin’s wounds. Norman Osborn enters, congratulating the new Goblin on a job well done. “Huh?” Moment: I guess the reader is supposed to infer that Osborn and Override came to some agreement off-panel for him to be rewarded a fraction of the $10 million, and for his wife’s medical bills to be paid. As the story is presented, however, there’s no clear motive for Override to hand the money back to Osborn. Spider-Man’s webbing mask doesn’t match the design seen in Peter Parker, Spider-Man #89's cliffhanger, since it isn’t supposed to be covering his hair. Shotgun has mysteriously disappeared in-between issues and materialized several blocks away from last issue’s explosion. Spider-Man overhears Normie refer to the Goblin as “Daddy,” making him wonder if Harry Osborn has returned from the grave. The new Green Goblin, as shown from the back, is a bald, white male. Osborn refers to him as “m’boy,” which is also his nickname for Flash Thompson. MJ tells Peter that she has an idea for how he can avoid the $5 million bounty, although several issues pass before we learn her plan. Creative Differences: In the opening, the art has the Punisher pointing his gun at Spider-Man, even though he gave up the fight last chapter after he realized that he was being played by Norman Osborn. The dialogue covers for his by giving the Punisher a feeble new motive for holding Spider-Man at gunpoint. Production Note: This is a forty-eight page comic with no cover enhancements, priced at $2.99. A variant cover does exist. Review: “SpiderHunt” concludes, and aside from a few hiccups, the finale actually leaves the reader with the impression that there was a coherent plan behind this after all. 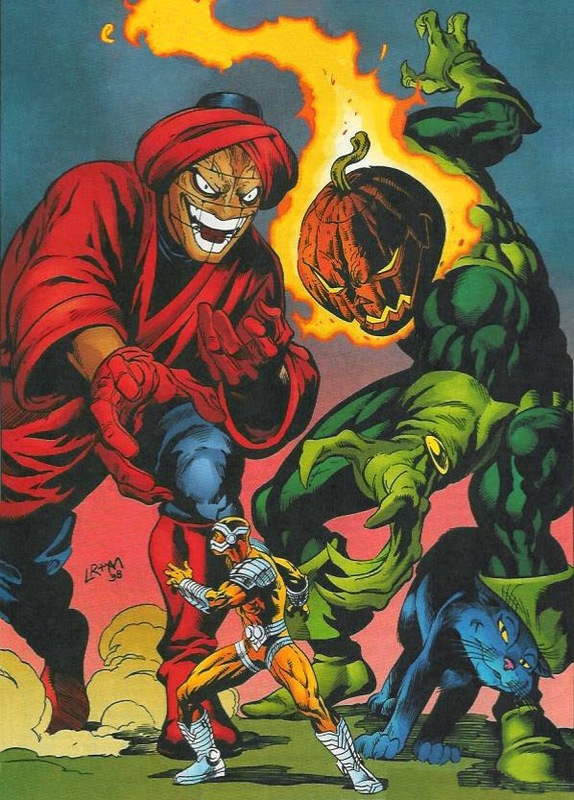 Splitting the story between Tom DeFalco and J. M. DeMatteis is a novel way to close out the crossover; having DeFalco plot lessens the continuity issues that might emerge from bringing in yet another writer, while DeMatteis’ script is much sharper and emotionally resonant than anything DeFalco has produced lately. With both writers combining their talents, the reader is getting an ending that makes a certain amount of sense, with a script that’s able to augment the drama and sell the emotional moments. I tend to think franchise books should have as small a writing staff as possible, especially in a storyline that directly crosses over from title to title. Even if DeFalco didn’t seem overly enthused by the crossover in his earlier chapter, I have to admit he manages to tie the disparate threads together this issue into a pretty satisfying conclusion. Clarence Fielding actually has a point after all! Arthur Stacy’s role is still dangling out there aimlessly, true, but there’s only so much closure I can expect from a crossover co-written by Howard Mackie. It’s a shame that the Spider-titles of this era rarely feel this coherent. There’s a lot going on in this issue, making it truly deserving as a double-sized special, and any number of these threads could potentially go somewhere interesting. Not only is recovering alcoholic Flash looking to Norman Osborn as a role model, but now Betty has bought into Osborn's act. The new Goblin may or may not be someone we know. Jonah is beginning to stand up to Osborn. Ben Urich wonders now if Jacob Conover is up to something, while the Bugle tries to carry on without Robbie. A price remains on Spider-Man’s head. The Stacys are almost starting to develop personalities. Unfortunately, most of these plots either don’t have real conclusions, or they end as spectacular failures.